For health and other community benefit, The Pongo Fund supports Spay/Neuter unless deemed unsafe due to age or other issues. If your animals are not spayed or neutered we will help you get that done. The help we provide varies and is based on each individual situation. 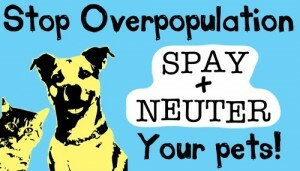 The benefits of Spay/Neuter are many for both your pet and our entire community and we look forward to talking with you more about this when we have the chance. Your full legal name, address and telephone number. Do you currently have a veterinarian? If so, who is it? Where your pet was adopted or purchased from? Specific information is required. For example: shelter, humane society, rescue group, bought from breeder for $100, friend, found, etc. Has your pet received a current rabies vaccination? If so, when and where was it done? Is your pet licensed in the county in which you reside? Are you currently employed? If so, how many hours do you work per week? Do you currently receive any social service or government assistance? If so, what? Do you have other pets? If so, what kind and how many? Have you ever been arrested for or charged with a crime against animals? Please note that we may schedule a home visit to meet your pets. We’ll be back in touch with you after we receive your information. *If age or illness is a concern, please ask your veterinarian to provide you with a letter explaining the concern.